Overview: Research physicist and graduate student Ray Palmer discovers that combining ultra-violet rays with material from a white dwarf star allows him to miniaturize objects. While leading a college field trip, Palmer and a group of students are trapped in a cave-in. Palmer leaves the group and finds a way to expose himself to the process to shrink himself. Palmer is able to get out of the cave and rescue the students. Crafting a red and blue costume, Ray Palmer adopts the identity of the Atom, protector of Ivy Town. In that same issue, we meet Ray’s girlfriend, lawyer Jean Loring. Throughout the issues in this volume, Ray proposes to Jean multiple times but to no avail. (We do not see Jean’s acceptance until Showcase Presents The Atom Vol. 2.) A small supporting cast is also introduced, with Professor Hyatt, who develops the Time Pool used for many adventures, and lab assistant Enrichetta Negrini. Jason Woodrue makes his DC Universe debut in The Atom #1, going by the name of Plant-Master. (He would get a power upgrade and a new name, Floronic Man, in the mid-1970s.) Other major foes including the time-focused Chronos and the JLA villain Dr. Light, who thinks that maybe he needs to face off against the smallest JLA member to rebuild his reputation. Why should these stories be Showcased? : For all of the times that I have bashed the Silver Age books from DC Comics. I will go overboard in my praise for this book. This is a great collection! Some of the best comics I have read from DC Comics from the early 1960s. 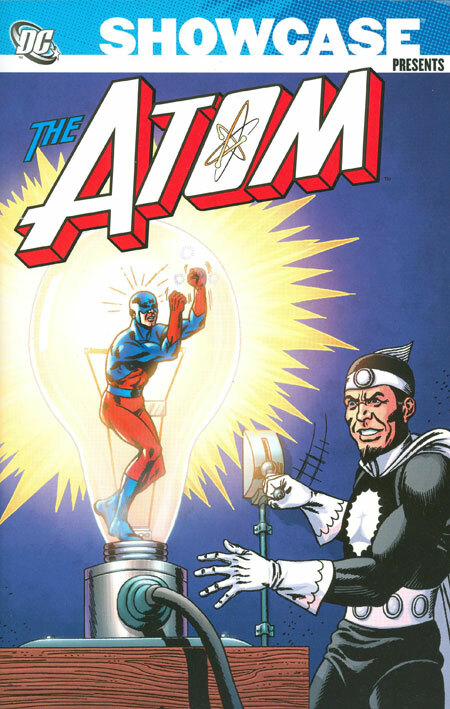 The Atom quickly became a mainstay in the DC Universe, becoming the second hero invited to join the Justice League and a core member for 20 years of that title. Some of these stories may seem simple, with the Atom fighting common hoods or rogue scientists. His chief foe in Chronos is introduced, who would return over and over to challenge the Atom. Gil Kane’s art, which has already been showcased in Green Lantern, is breathtaking in its simplicity. I really believe this should be part of your collection to see how good DC Comics could be in the 1960s. Footnotes: The Atom #7 is also reprinted in Showcase Presents Hawkman Vol. 1. If you like this volume, try: the Sword of the Atom trade paperback released in 2007. In 1983, DC released a four-issue mini-series which shook up Ray Palmer’s universe. Ray found out that Jean was cheating on him, and was unable to cope with the news. The Atom travels to South America, where he discovers the miniature Morlaidhans village. Ray rescues the village princess and battles jungle animals. Ray Palmer eventually comes to terms with the changes in his life, giving Jean his blessing for her to move forward with her life while Ray remains with the Morlaidhans. Gil Kane’s art is spectacular in this collection. The trade paperback collects the miniseries plus three subsequent specials that DC released in 1984. This is one of the best Atom stories, so do yourself a favor and track it down. This entry was posted in Atom, DC Showcase Presents and tagged Atom, Gardner Fox, Gil Kane, Murphy Anderson. Bookmark the permalink. Pingback: Throwback Thursday – Showcase Presents The Atom Vol. 1 | WORST. COMIC. PODCAST. EVER!